If there's one thing a Londoner needs right now, it's a good jacket — seriously, Mother Nature, can we at least pretend it's spring? 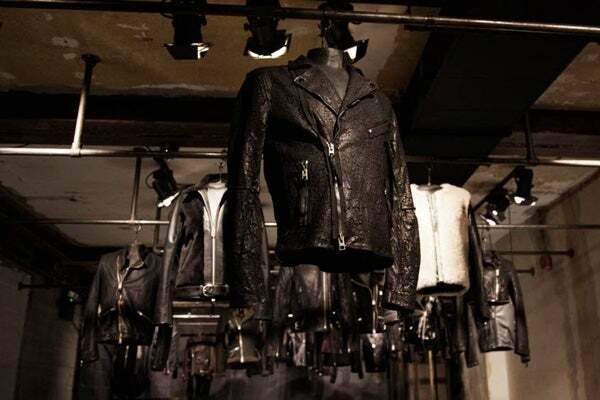 But, given the weather situation, we're fortunate in that there's no shortage of inspiring outerwear at AllSaints' Covent Garden shop, where the stripped-down space is hosting an exhibition of 50 one-of-a-kind biker jackets created especially for The Biker Project (Series 1), the first of many installations highlighting the British label's most iconic piece. Making its debut in London before heading to New York City and other global cities, the exhibition showcases just how skilled creative director Wil Beedle and his team are at transforming the standard biker jacket — with python, oxblood-hued ponyskin, textured leather, capes, and short-sleeve versions all on display. By year's end, the jackets featured will be auctioned off for charity, with some select men's and women's styles potentially being produced to sell in stores. That'll be welcome news to London's style set. Bip Ling, Ruta Gedmintas, Amber Atherton, Gemma Chan, Ben Grimes, Harry Treadaway, Carl Barat, and Rosie Fortescue all came out last night to see the jackets in the flesh, with the ice-breaker question of the night being, "Which one is your favourite?" To come up with your own answer, pop on over to the AllSaints shop at 5 Earlham Street, where the installation will be running through next month. Let the lusting begin!